Cell phone itself doesn’t make sense without having a good carrier signal. Getting a good carrier signal not only depends upon the carrier provider but also depends upon the signal reception on your phone. Signal strength mainly varies due to hindrances caused by large buildings, trees, terrain, etc. Weak signals cause dropped calls, slow data rate and bad voice quality. In order to reduce this problem zBoost brings a device called zBoost ZB545 SOHO. How to Install zBoost Cell Phone Booster? The external antenna is mounted on a place where your phone gets maximum signal strength; ideally, it is placed on the roof. After mounting the external antenna, you need to place the unit base at such place from where you can get the widest possible signal area like middle of the room because this unit creates cell zone. The internal antenna will be attached to one end of the base unit and make sure, that the distance between internal and external antenna should not be less than 15-feet, otherwise you will not get strong signals. Whereas, increasing the distance would have increased the signal reception. The coaxial cable is used to attach the external antenna and the base unit. In the end, after connecting the supply using provided adapter the cell phone reception booster will start working when the stable green light is ON. How Does ZB545 Cell Phone Booster For Home Work? 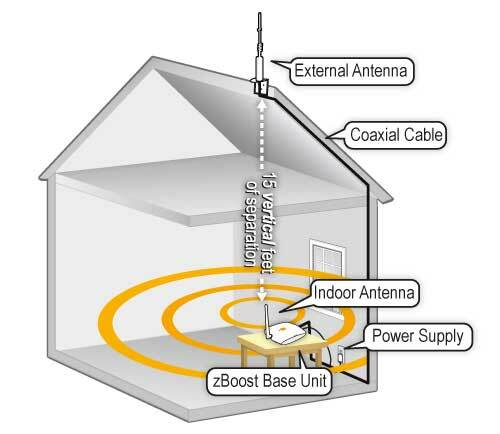 After setting up the zBoost cell phone booster for home, it is ready to receive maximum carrier signal from external antenna and rebroadcast it through internal antenna to all the cell phones within the range of up to 2,500 square feet. External antenna collects signal from multiple towers, in order to provide the strongest possible signal to the base unit to re-broadcast. It is best to use for home or you can even use it in office too as it provides faster performance for multiple phones. This zBoost home cell booster not only strengthens your carrier signal but also reduces the battery consumption of your phone. Don’t place the Base Unit on the floor. Place the unit at least 2 feet away from other cords, metal objects or other wireless devices. The zBoos SOHO cell phone booster for home is a dual band 800/1900 MHz device, which works with all the US carrier providers including AT&T, Sprint, T-Mobile, Verizon, Alltel, Cricket, and all the networks that supports CDMA, GSM GPRS, EDGE, EVDO, 1xRTT, UMTS, HSPA, 3G technology. Where To Buy ZB545 SOHO Cell Phone Reception Booster? 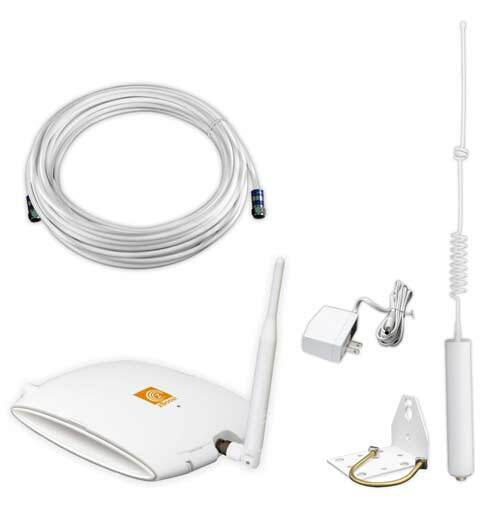 If you are living in such a region, which is surrounded by large buildings, trees, or you are living in a countryside area, then this ZB545 cell phone signal booster is must for your home or office. You can buy it from Amazon store at 48% discount rate with Free Shipping.